GDG New Delhi has been an active chapter since 2011. Arpan Garg and Rohan Arora are both experienced organizers who offer their insights on managing a community of 1.3k members that covers a large geographical area. They also have a simple solution to make networking an engaging and meaningful experience for all participants. This is a common question that we ask almost every organizer, but the answers are always different. Why did you become involved in organizing GDG meetups? Rohan: I was in my 1st year of college when I attended my first GDG event and it was an awesome experience. I learned a lot from the mentors and organizers and wanted to volunteer at their events. About 3 years ago, I transitioned from a volunteer to the organizer role. 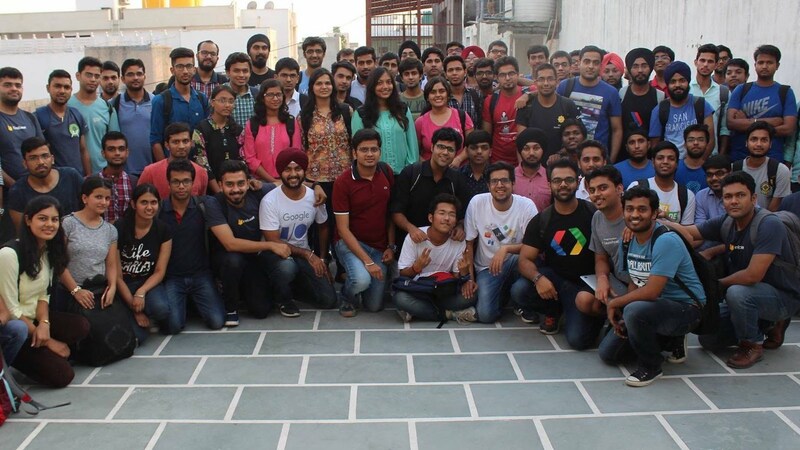 GDG New Delhi has been active since November 2011 and now has 1.3k members. Arpan: My journey was completely different. I was working with Rohan on a project and we talked about GDG New Delhi and their meetups. I was working as the only tech employee for a startup at that time, and to hear about a community sounded very exciting to me. I attended a codelab on Firebase for Android soon afterwards. I liked the casual atmosphere and fun environment to learn and share knowledge. A month later, I was already a speaker at DevFest 2015. About a year ago (in 2016), I became an organizer. Rohan: I teach Android development, and being active in GDG New Delhi definitely helped me to improve my art of teaching. Arpan: For me, since I was working alone, making friends and learning about new things in the world of technology was a key motivator. It has helped develop my professional network as well. I always felt like I'm a good speaker, but there is always room for improvement, right? So speaking regularly at GDG meetups enables me to improve my public speaking skills, as well as learn about new technologies in-depth in the process of preparing for the sessions. How are you motivating your members to speak at meetups? Arpan: We've set up a Github page where members can raise an issue or suggest a topic they are able to give a speech on. Before a meetup, we go through the list, get in touch with the speaker, and prep together for the presentation. We want to make sure that they deliver the content in an interesting way. For big events like DevFest, we have a special (separate) call for papers. It seems that you have good process in place to have a pipeline of speakers. Did you ever have any troubles with finding speakers? Arpan: Yes, there were definitely times when we had to actively reach out to speakers. Rohan was still studying, so he was able to scout students who never led a session, but were willing to try after a bit of coaching and showing them that it's a safe environment. I remember a situation where there was a college freshman talking for the first time in a meetup. There were 30-35 people there and he got really nervous. But the crowd supported him and eventually helped him to overcome his nervousness. Rohan: What also helped with speakers was to partner with other communities and coworking spaces. We regularly work with JS Lovers (members of the Google Developers Community Groups program and other communities like Women Who Code, Kotlin New Delhi User Group, ThoughtWorks or Coding Ninjas. That's great to hear that you have a locally interconnected dev ecosystem. I'm sure that helps on many levels. Still, it's been 2-3 years for you as organizers. How do you find balance between your organizer's life, work and other things you have going on? Rohan: Actually, I would appreciate some advice on this myself (laugh). I just started working full time 3 months ago, so I'm still adjusting. Arpan: Yes, it can definitely get overwhelming at times. At I/O Extended 2017 I was actually feeling pretty ill for a few days. But when the excitement of the event actually happening kicks in, you forget that you are not well. The challenge for us now is to have a regular schedule of events. That makes planning more organized and less complicated. At the end, we as organizers, have a responsibility to the community to make things happen and we enjoy this. We see it as something we love to do. What tools and techniques do you use to manage your chapter? Rohan: We have a very active Slack group. Before that we tried Trello where we posted info on our meetups, but we discontinued that. As we mentioned before, we also use GitHub.com. We tried Hoverboard for helping out with DevFest management. We’re considering having a community newsletter in the future. Arpan: We’re looking for a tool to manage and track attendance for our events better. Do you facilitate conversations in you Slack channel? Rohan: It has become self sustainable, so we don't facilitate it much. Do you have a separate Slack for you as organizers and for your members? Rohan: We have different channels based on technology, but one common Slack for organizers and members. What are some of the challenges you are facing at the moment? Rohan: We're a region covering a large geographical area. That makes it difficult to choose the most convenient location for a meetup. People sometimes have to commute 1-2 hours. We usually get a lot signups for every meetup – 1-1.5k of them. Selecting the right people is challenging. Arpan: Yes. We get so many applications and even if we select carefully, we still have people not showing up in the end. Rohan: We’re actually thinking of keeping a blacklist of people not turning up after they confirmed the attendance. How big are your meetups? Arpan: It depends very much on the given venue. We have had meetups with over 200 attendees in the DevFest season. Usually we have on average 60-70 people in our meetups. To tackle the challenge with venue size limitations and people commuting from far away, some chapters record their meetups. Were you considering recording or live streaming? Rohan: We tried to do livestreaming on Facebook with our mobile phones. That attracted a nice crowd and it kept the conversation going. It's also a solution to the problem of people commuting to our meetups from far away. Arpan: The livestreaming to Facebook is interactive but still not the best tool. The sound quality is good, but the video gets pixelated and something that is shown in a presentation is not clearly visible. We're exploring other options as well. Rohan: Whenever we have a beginners event and we have people who are able to create their first app afterwards, that's always a big moment for me. It reminds me of how I started and how that got me motivated to continue learning. I'm also pleased to see that we have members that have been coming to our meetups regularly for the last 2-3 years. Arpan: I completely agree with Rohan. Codelabs are my favorite type of events. I always make sure that almost everyone is able to comprehend and complete what is being discussed. They will take this experience back home with them and build on that. Another thing is the communication and networking. At Google I/O17 Extended we had a dedicated and facilitated networking session for the first time. We sat in a circle and discussed eachothers' stories. I actually pointed to people and asked them to share something with the group. Usually we offer time for networking on meetups as well, but developers are shy creatures (laugh). So I was happy to find a way to make them more open to speak. You mentioned that you have networking as a regular feature of your meetups. How do you structure your meetups? Rohan: We rely on the GitHub thread and current Slack conversation for content suggestions. Speakers prepare their own presentations afterwards. Arpan and I use Google content for our presentations at times. It's actually a big help for us as organizers. We also make sure to announce if the content is for beginners or for more advanced developers. For advanced developers we ask for links to their apps or GitHub to evaluate their skills. Rohan: It's #DevFest17 season and ours is coming up on October 29. This year we're having sessions in 2-3 different locations at the same time. Any message you would like to share with other organizers? Rohan: I want to thank all organizers around the world for the work they're doing. They are inspiring a lot of young minds.